Scroll down for current listings, pictures, video, property details, maps and investment info. ******* We're not allowed to publish recent sales info. Click here to read why and how to find this information. Already own in tower B? Thinking of selling? Click here and read about current search trends & our web network. The Caribe Resort in Orange Beach, AL currently consists of 3 towers. 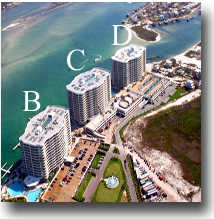 The Caribe condos for sale located in building "B" are listed below along with the option to search one, two or all three towers. Caribe has the area's closest marina to the Gulf of Mexico and has a plethora of amenities to appease residents and guests alike. If you have questions about the Caribe or any other condo in the area, please email info@condoinvestment.com or call 251.Area.Pro (251-273-2776) for immediate assistance. Rental numbers are approximate and can vary depending on a variety of factors. Click here to learn how we greatly increase investment return through a network of condominium websites. This service is completely free and only for our clients. Click below to search for Caribe condos for sale in a specific tower or click here to view all condos for sale in Caribe / main page.